Adolph Muhry’s global disease map in the book entitled Die Geographischen Verhaltnisse der Krankheiten oder Grundzuge der Noso-geographie (The Geographical Relations of Diseases, or Outlines of Noso-Geography) is very important in medical geography history. We are often referred to Johnston’s map of disease geography produced about the same time. Muhry’s heritage was in par with that of three other important German cartographers for the time, Alexander von Humboldt, Friedrich Schnurrer, and Heinrich Berghaus. In a detailed biography of Muhry produced by medical geography historian Nicolaas A. Rupke, Muhry is commended for his numerous contributions to the combined studies of natural science and disease as a whole, as well as to the cartography products that would later be produced by such famous late ninteenth century medical cartographers as Arthur Bordier and August Hirsch. More than likely, 1856 is not the first time that either Muhry or Johnston developed preliminary versions of these maps. 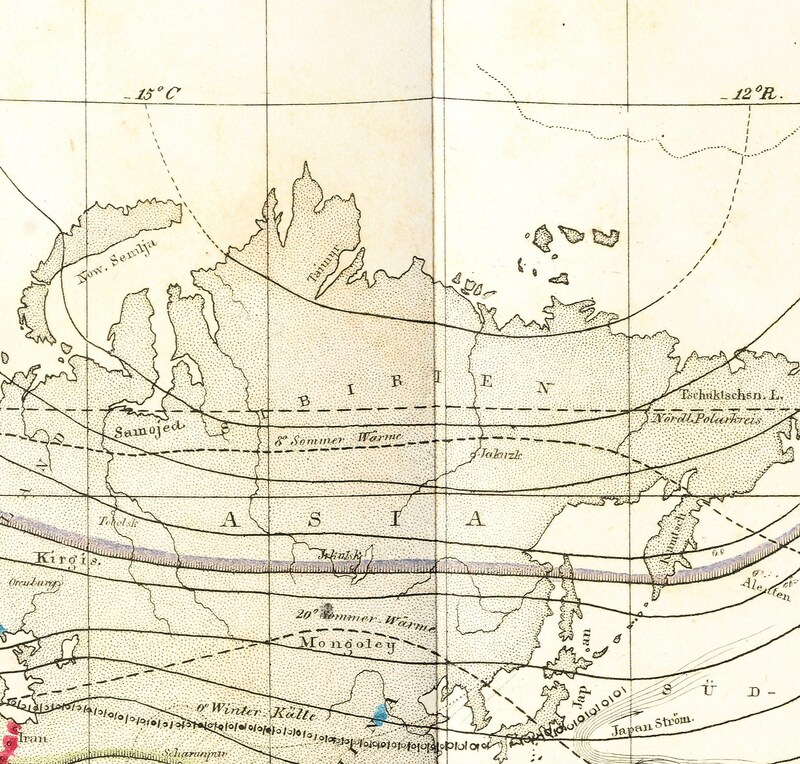 Muhry, Johnston and other cartographers were heavily dependent upon the use of isotherms to define their theories related to the miasmatic theory for disease. Depending upon their knowledge base and their philosophy, they could base such a theory on any number of arguments, many already published. about the geographic, topographic, geologic, pedologic, hydrologic, climatic, isothermal and demographic features required for disease-stricken areas. 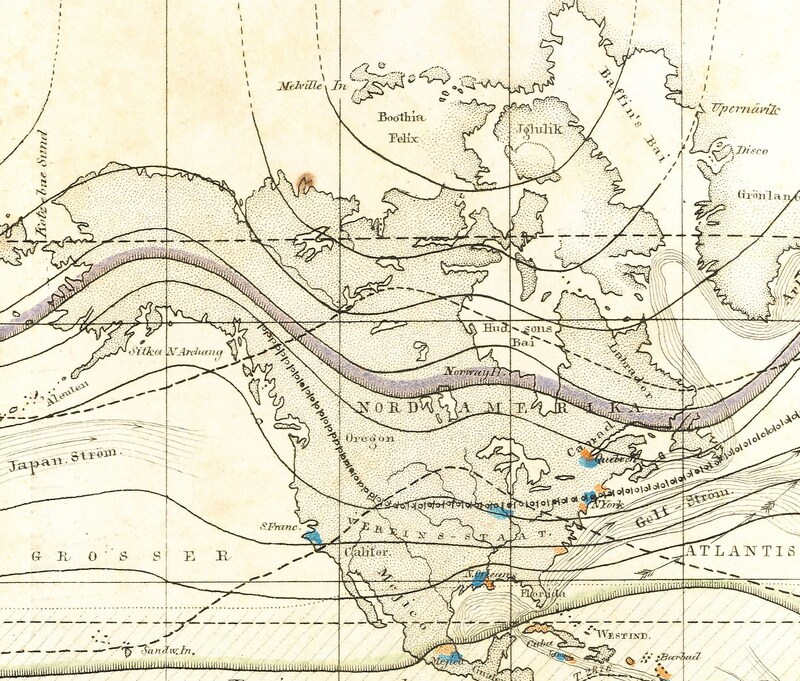 However, 1856 is the year that two of these medical geographers–Muhry and Johnston–had their disease maps published. 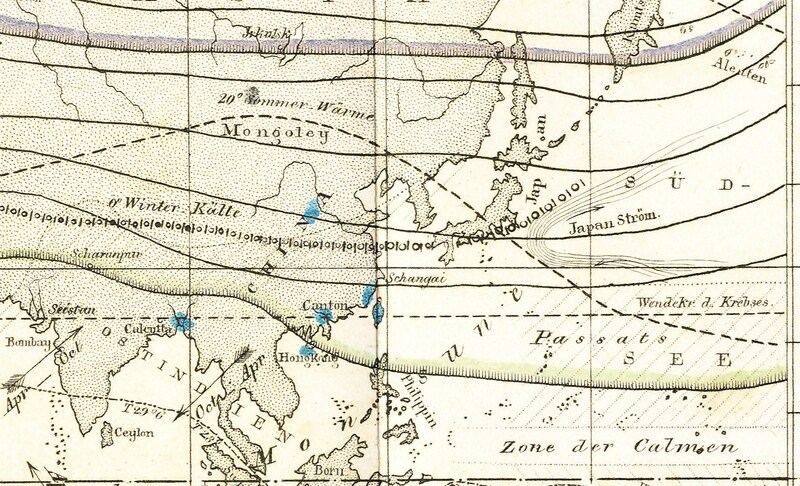 These maps were intended to be improvements on previous medical geography writings typically produced without any matching adequately detailed cartography of the writer’s claims. On interesting question this brings up in history, the kind of question common to past and present interpretors of history and its historiography: why did Johnston’s map win out over Muhry’s in the decades to come? Like many simultaneous inventions or discoveries, it was the exposure to the masses, the ability of these masses to read either German or English, and a little bit of international politics and Western European intellectual focus that made Johnston’s map better known than Muhry’s. In retrospect, both had their particular features and benefits that are worth paying scholarly attention to. What make’s Muhry’s map distinct from Johnston’s is his Humboldtian way of interpreting illness and disease. This is the most important point made by historical medical geography Nicholaas Rupke in his chapter on Muhry included in a book, which he edited, entitled Medical Geography in Historical Perspective (Medical History, Supplement Number 20, The Wellcome Trust Center for the History of Medicine at UCL, London, 2000). Whereas Johnston and many pro- and pseudo-Anglican Western European epidemiologists were trying to worked to prevent any interpretation of human and social factors from playing a role in defining the cause for illness, Muhry, like Humboldt and other German anti-establishment pre-socialist thinkers, felt population features like poverty, lifestyle and place of residency played a very important role in this part of the human development, social evolution process. It was these factors that some of Muhry’s natural philosophy of disease focused upon, enough for him to not only gain significant amounts of local support but also develop a significant lack of support from other more socially-elite medical geographers making their claims in documents supported and published by none other than the local political leaders. Most important to understanding Muhry’s natural philosophy of disease is understanding how he interprets the natural events as they occur in relation to disease. 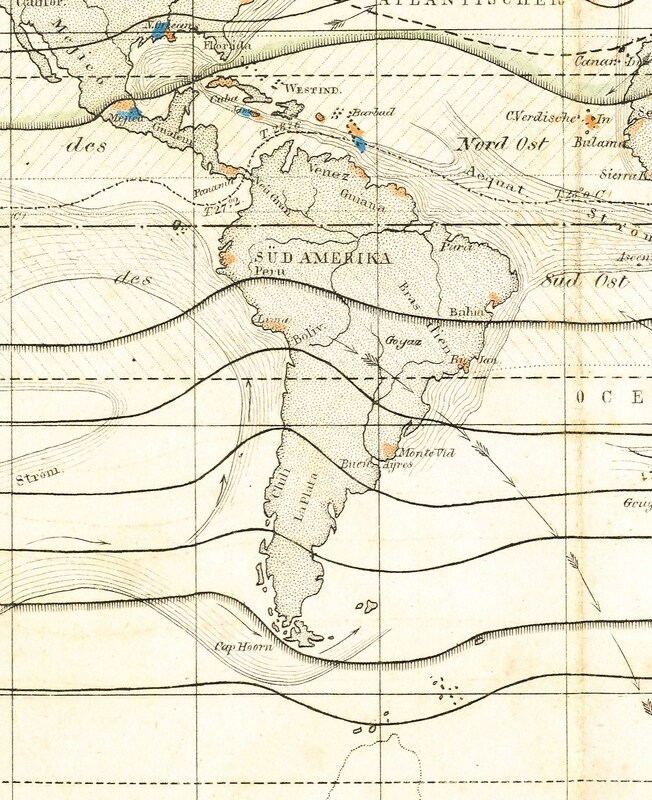 He places some of his emphasis on specific isotherms and the local flow patterns for air masses and ocean water, the latter more so than is displayed by Johnston’s map. Muhry also tends to emphasize point-related disease information more frequently than Johnston. Whereas Johnston is basing his map on the information that British explorations and the explorations that British allies were willing to provide, Muhry was relying heavily upon the influences of several Eastern European specialists in the field of medical topography, plant ecology, and medical climatology. One of Muhry’s more important disease ecology contributions included the development of a method to define miasma as a result of local plant-related features. He even applied this theory to the growing popularity of the animalcules theory; like many other medical geographers, Muhry felt there was some relationship between flora types for a region and its ability to harbor or sequester certain known disease-related organisms like the microbial worm, the mosquito and fly populations, the local ticks, spiders and other ground insects, etc. Taking this natural philosophy-based argument one step further, Muhry also argued that since diseases are like plants in that they are temperature-dependent, that this may even play a role in terms of their distribution around the world. Muhry felt that both electricity and magnetism played a major role in the placement of behavior of certain disease types, in particular as these features related to the earth’s surface, topography and latitude-longitudinal features (for example, we find several lines on the map depicting storm flow patterns, or periodic windflow patterns link to specific seasonal fevers). He also contributed an entire chapter of his book to his view of the role of hygiene as an environmental and human behavioral practice responsible for the control of disease. temperature-dependent … Tropical-zone … Polar-zone… Northern hemisphere vs. Southern hemisphere (latitude, longitude and isotherm defined and regulated, with effects related to specific tropical and polar isotherms defined based on isotherm lines detailed in the legend), i.e. the distributions of yellow fever, malaria, asiatic cholera, typhoid, and perhaps mumps, diphtheria, pneumonia, and severe forms of dysentery. singular-endemic (regionally and ecologically restricted, usually defined by specific latitudinal and longitudinal values as well as specific ecological features), i.e. specific ulcerations and dermatological deformations or maladies, or in a contemporary sense, regionally restricted fungal diseases such as chiclero’s ulcer and ear, natural to Mexico and a few parts of Central America. geographically or areally excludable, or diseases that are dispersed, but restricted from striking certain environmental settings due to undefinable local features, i.e. tuberculosis is for the most part ubiquitous except in relation to high elevations. Historian Rupke notes on Muhry emphasize Muhry’s ability to take people and culture into account, focusing on the “social evils” of “Volkskrankheiten” (diseases afflicting common people) [Rupke, p. 96]. Muhry’s climatic interpretations of disease were meant to be applied to finding the means to prevent and perhaps even cure a given malady. It was this philosophy that helped to popularize the whole movement towards using climate, and the ability to move from one climatic region to the next, as the means to help treat your diseased state. Muhry’s intent, however, was different. It was Muhry’s hope that a more pre-socialist interpretation would come into play with this presentation of medical noso-geography, resulting in the ill moving to places where the masses were not so ill, as a consequence of the climate and its impact on the population of peoples as a whole. Neither Muhry’s nor Johnston’s approach to defining medical geography is better. Each has its own positive and negative features (although very little of the latter for both). Whereas the applicability and validity of eitehr Muhry’s or Johnston’s map is dependent mostly on the truths and applicability of the knowledge upon which these maps were based, Muhry’s and Johnston’s map each play an important roles in helping physicians develop a better understanding of their disease ecology patterns and how local climatic, meteorological, ecological and topographic features relate to unique epidemic and locally recurring endemic disease patterns. The following figures are include the legend for the above map and specific continent- and/or region-defined sections of the above map. These sections are enlarged to emphasis the climatic, atmospheric and oceanographic patterns which Muhry felt were related to specific disease types. Northern Polar isotherm line (“Nordl. Polarkreise”); Tropic of Cancer. 0 degree ‘R’ Winter Cold line (“Winter Kalle”) [very fine dotted line]; edge of tradewinds zone. “Passats” regions, oceanic and continental, with Calm Zone inbetween. Muhry, Adolph. Die Geographischen Verhaltnisse der Krankheiten oder Grundzuge der Noso-geographie. Leipzig and Heidelberg. 1856. Nicholaas A. Rupke. “Adolf Muhry (1810-1888): Gottingen’s Humboldtian Medical Geographer. ” In Medical Geography in Historical Perspective. (Medical History, Supplement No. 20). Nicholaas A. Rupke (ed. ), London: The Welscome Trust Centerfor the History of Medicine at UCL, 2000. pp. 98-117. NOTE: The R system for temperatures today is Rankine: [°R] = [°F] + 459.67. 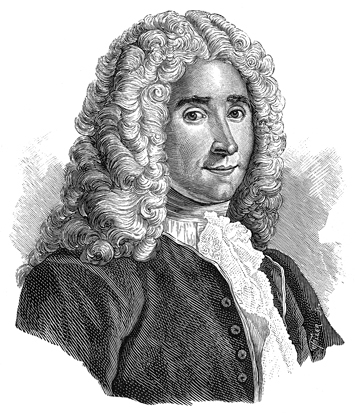 René Antoine Ferchault de Réaumur (1683-1757). Réaumur’s scale places freezing at 0 and boiling at 80, uses the abbreviations °Ré, °Re, and °R, and is known as the “octogesimal division”. 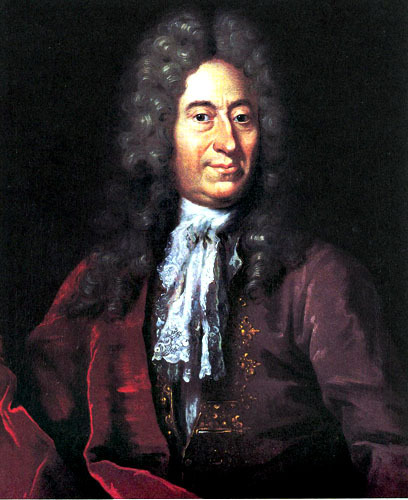 Danish astronomer Ole Christensen Rømer (1644-1710) invented a 60 degrees scale in 1701, which set freezing brine or slat water at 0 degrees and boiling at 60. This way, the freezing of pure watrer took palce at about 7.5 degrees.